"Hello, this email is for Linda Jones. My name is Gabriel Schleifer, I'm a 3rd year animation student at The School of Visual Arts. 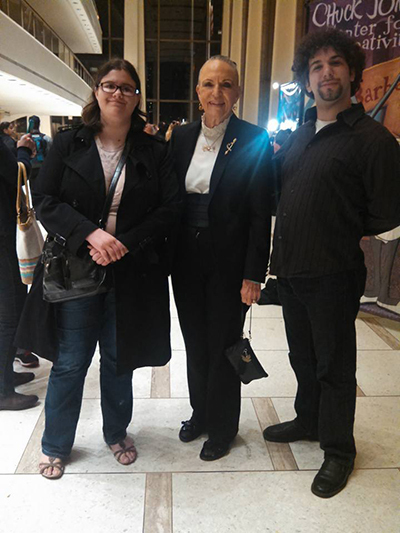 She and I met at Lincoln Center a few days ago during the Bugs Bunny at the Symphony concert where she and her granddaughter were promoting the Chuck Jones Center for Creativity. "I just wanted to let you know that I had a great time chatting with you about your father and about the foundation, not to mention all of the talented artists who are already helping. It's wonderful to be able to speak to someone who is, in some way or another, a part of the history of this extraordinary art form and is making sure the revolutions of it's pioneers lives on. "Here are a couple of photos taken from the event. I plan to stay in touch with this organization."